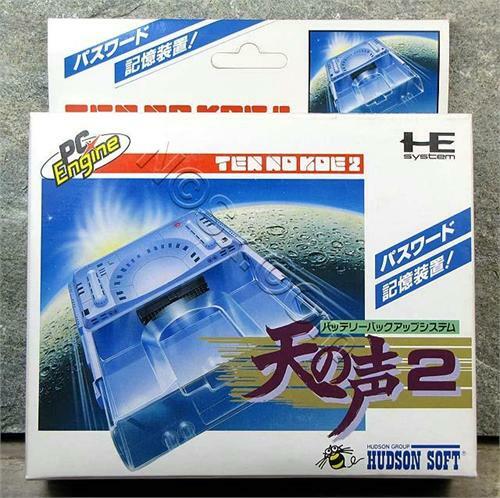 «©NCSX» Brand new and factory boxed Ten no Koe 2 Bank for the PC-Engine which is a save-data accessory. Back in the day when the PC-Engine was a contender, RAM was expensive so companies like NEC opted to not include any S-RAM in their consoles to keep costs down. The PC-Engine did not have any internal save-ram for data storage but the Tennokoe 2 Bank adds that function with a whopping 2K of S-Ram. You read that right. 2K. Once the Tennokoe 2 is connected to the back of the PC-Engine, games that support data-saving can now be stored to memory and the option will appear on the game's title or menu screen. The Tennokoe Bank requires two AA batteries. Two AA batteries are included in the product packaging but please note that they're most likely dead since it's been over 20 years old since the Bank was released. NCS' remaining inventory is brand new and factory boxed in the original cardboard container. The condition of the packaging is in excellent structural shape with no signs of wear or weathering. The Tennokoe 2 Banks are in brand new and pristine condition. Pricing per Ten no Koe 2 Bank is set at US$46.90 each. If you reside in the USA, NCS recommends USPS Ground shipping for the most economical domestic service. This document and photos are ©NCSX 1989, 2010. All rights reserved. No reproduction in whole or in part of this document may be made without express written consent of National Console Support, Inc. Brand new and factory boxed PC-Engine Turbo Stick for the PC-Engine which was NEC's first and last joystick controller for their own console. Brand new and factory boxed XHE-3 MSX Controller Adapter for the PC-Engine which allows MSX joysticks and joypads to be used with the PC-Engine.